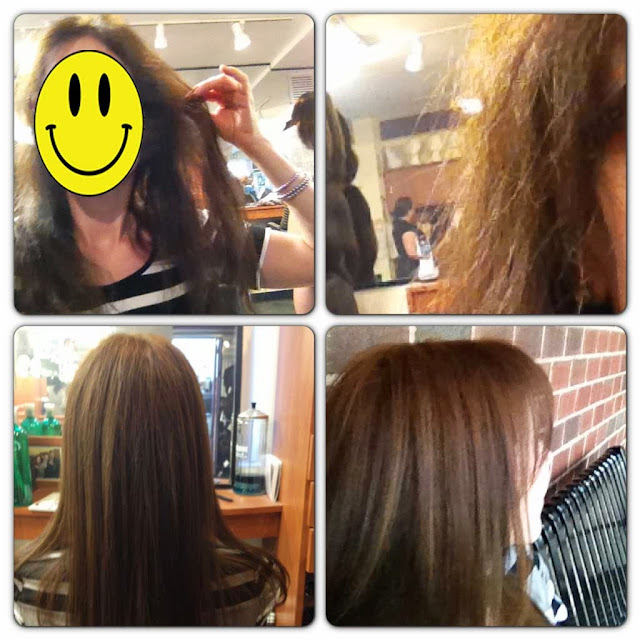 Note: I start this post with a funny story and then include my own before & after pictures when I finally decided to get a professional Brazilian keratin treatment. But I first started with the drugstore kit (which did not work!). It started with a coupon. 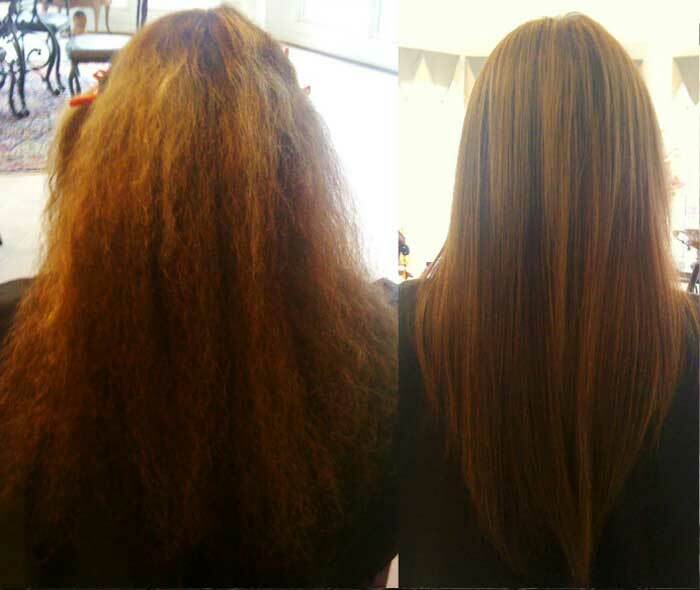 "Get the miracle Brazilian Keratin treatment at yaddayadda salon!" I called a friend. "I just saw their before and after pictures and I think I need to get this coupon," I said. "$169," I said, "but the regular price is $400." "Oh don't pay that. That's my stylist's normal price. She's running a special now, go see her." Yeah, me too. Only I'm still terribly chicken about doing anything to my hair. It doesn't need extra help falling out. Formaldehyde does terrible things, right? I usually try to avoid bursting into flames regularly so in my reluctance, I bought an over-the-counter version that claimed to be formaldehyde free and figured okay, if this works even 20%, fine. Step 1: Spend 2 hours on internet reading everything you can find about brazilian keratin treatment. Feel both excited that SOMETHING can maybe help your hair look awesome and terrified that the process's various formaldehydes will cause you to grow two heads (which of course will be twice as expensive for hair maintenance). Plus that last time you burst into flames wasn't that cool. Stay skeptical. Step 2: Go to drugstore. Realize you only put 6 minutes into the meter and that won't be enough time to sniff, read and analyze every hair product they carry. Return to car. Pay for spot next to it by accident. Contemplate driving away rather than fixing mistake. Return to drugstore in disgust and rebellion, taunting parking ticket fate. Turn hate outward and abhor entire city. 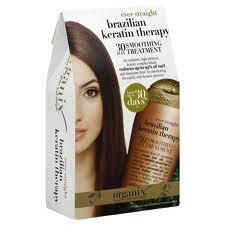 Step 3: Come home with brazilian keratin treatment that sounds natural. Cocoa butter! Avocado oil! Yay to avoiding the formaldehyde! Congratulate self on superior hair-product-shopping skills. Step 4: Read directions 3 times. Get cold feet. Why do you need gloves to apply avocado oil? "DO NOT GET ON SKIN" touts loud warning. "USE IN WELL-VENTILATED AREA." Frown. Consider abandoning mission. Step 5: Think about cute Halloween wig and resign to backup plan. Plus, it can't get much worse then the last experiment, right? Step 6: Read label carefully. "Apply product to hair that is 80% dry. DO NOT OVERSATURATE." Step 8: Let product soak into hair for half an hour. Down two glasses of chocolate milk. Plan to buy heavy-duty trash bags to transport clothes instead of using thin kitchen bags. Decide moving preparations are complete for the day. Step 9: Blow dry hair. Immediately understand the "DO NOT OVERSATURATE" warning. Use wide-toothed comb to pull gloppy, greasy strands straight. Step 10: Turn on flat iron and wait for it to reach maximum heat setting. Sing-scream Bad Romance, only this time being sure roommate isn't home like that last time. Get to second refrain before realizing neighbor can see and hear everything through open bathroom window. Curse ventilation. Berate self for constantly participating in mortifying activities. Google "lack of impulse control." Step 11: Start ironing hair. Become alarmed at smoky steam of residue burn off. Secretly hope this is what "sealing" keratin into the cuticle looks like because if not, that wig might actually get more use than expected. Step 12: Finish. Realize with horror "THIS HAS TO STAY SLATHERED ON HEAD FOR TWO DAYS??" Cancel all social plans where looking presentable is desireable. (In other words, everything.) (Except moving. The movers won't care if you look like a greased alpaca.) Become angry that you gave away your only non-snowstorm hat because you thought you looked terrible in hats. Feel too embarrassed to go to store for another. Start packing. Step 13: haha, just kidding about packing. Write blog post and take a nap! I finally decided to get an actual Brazilian keratin treatment, like, from a salon. A friend said "if you're thinking about getting that Brazilian keratin treatment but not sure, well, just flat-iron your hair. 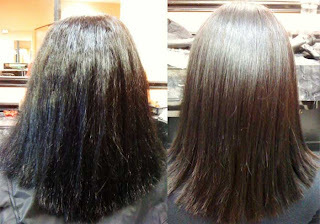 If you like the way it looks straightened, then you will like the way it looks with that treatment." I wasn't sure, because my hair is both fine AND thin, and I just didn't know how the treatment would come out. I was worried for a reason -- I was right. I think it is too thin (and now flat) and doesn't look that great. 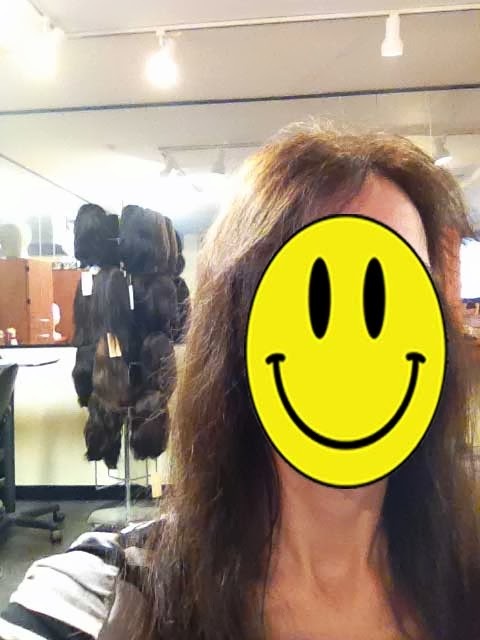 I took this in the salon just before the brazilian keratin treatment. (Sorry about all the smiley faces! Given the private nature of most of the rest of this blog, I don't want my face on it. See how my hair is wavy, but not curly? That makes the hair follicle nice & thirsty. Up close it looks frizzy. I'm not trying to be derogatory, just honestly portray what my hair is like. *Because my hair is thinning with age, my dermatologist encouraged me to use Rogaine -- men's 5%, not the women's 2.5% -- to prevent further loss. I buy the generic, minoxodil, because it's SOOO much cheaper. I am pleased to say that it seems to be helping although new hair took like 4 months before I noticed it and is even thinner and finer than my normally thin fine hair. And if I stop using it even for a few days, it falls out so you have to be consistent and apply it morning and night. 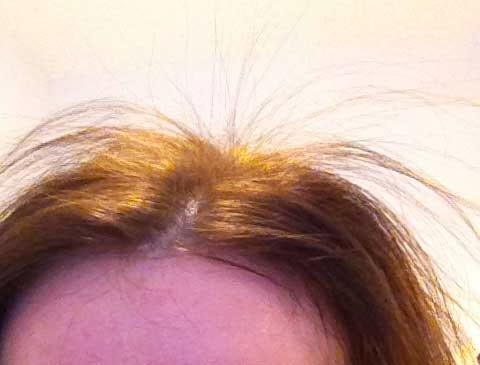 If your hair is thinning and you're considering options, ask your dr - I'm not a doc and I don't want to give medical advice on this blog. as I'll demonstrate below, but not so great for the front view. Also note, this photo is not a close-up so you can't see the flaws as easily. So, this is the most important one I wanted you to see. See how my hair is sticking straight up? This is the main reason I'm unhappy with it. Also, if you can look in the above photo of my part line and compare it to below, notice how the color is lighter there? I had JUST colored it the day before and it was very dark. Everyone said it is ideal to color first but the keratin treatment lifted some of the color out. I liked the effect everywhere but the part line though. It's subtle, however. I might notice it more than everyone else. 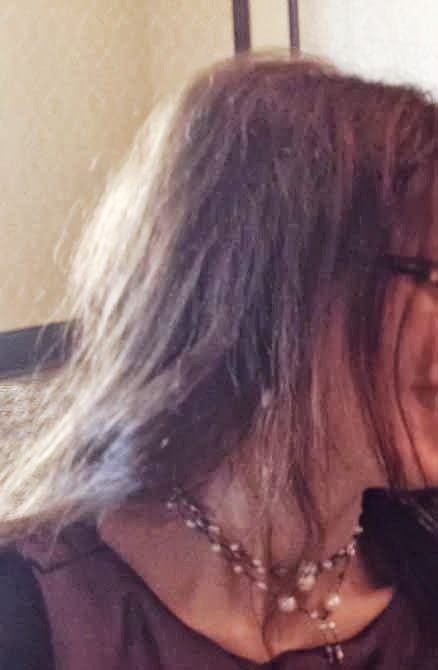 Actually I'm glad I got it done even if it doesn't look as awesome as I hoped; I'd been wavering about it for like, a YEAR, unsure if my hair was too thin to make this a good decision for me. Well, now I know. where it matters around my face so I'm not sure it's worth being a regular expense. I took this right after leaving the salon. Yuck! It seems 3% better than it was before but still messy-looking. UGH. Never again. At least not for me, although most of my friends have had a great experience with this. 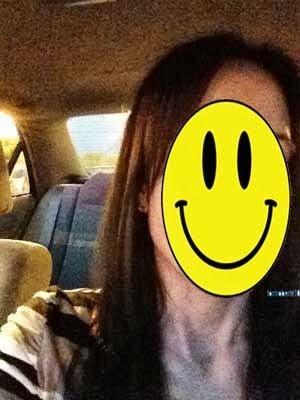 I think if your hair is very badly damaged from coloring, and is fine & thin, you might have similar results. If not, I bet it will turn out better for you than me. I like that it has some body now, but it definitely isn't sleek and smooth and healthy-looking. 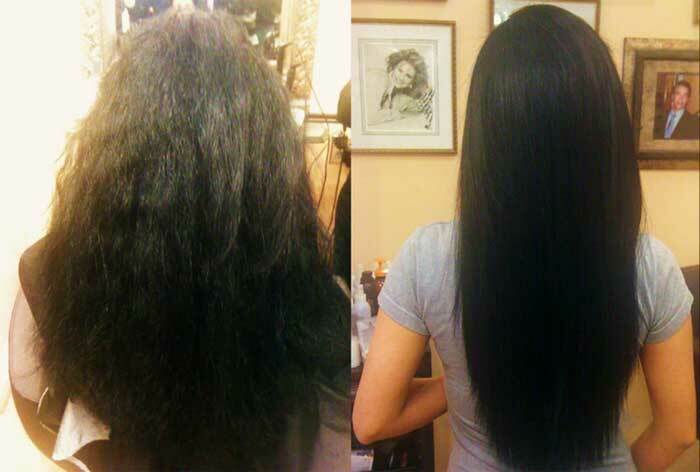 Left: right after the treatment. Right: the day I was allowed to wash it. It didn't take! Okay, so I got the Chi Enviro treatment - my stylist recommended it because my hair was very damaged and colored and this is a gentler form. No formaldehyde. My eyes didn't sting or burn as she was blow-drying it and flat-ironing it to seal it in. Steam came off but it didn't smell unpleasant (although I still didn't want to breathe it in). Another lady in the salon was having a regular keratin treatment and her stylist was wearing a face mask but neither my stylist nor I needed to. (I have healthy lungs but I am very sensitive to scents and chemicals so I am pleased it didn't bother me.) I have no idea about the health effects but I would guess they're more substantial for the stylist who is exposed much more often. Two other hair stylists that I know personally recommended the "Coppola" keratin treatment but that's not what I got because it's harsher on hair and mine is too damaged. 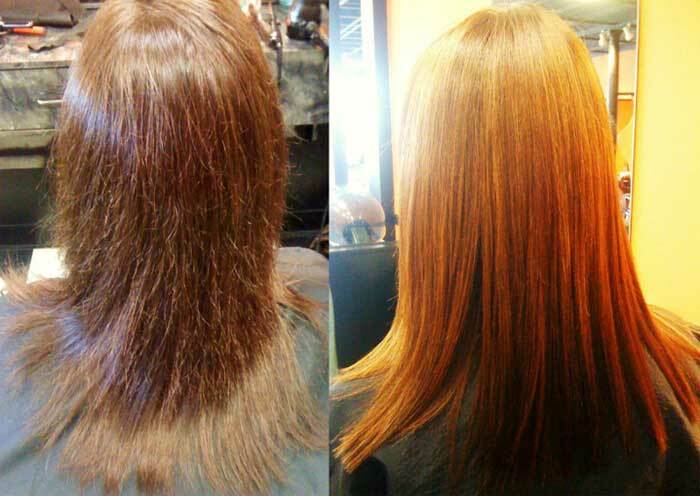 Both stylists emphasized that the results depend on the quality of the keratin treatment used and so brand really does matter. Chi Enviro and Coppola are supposed to both be very good brands. 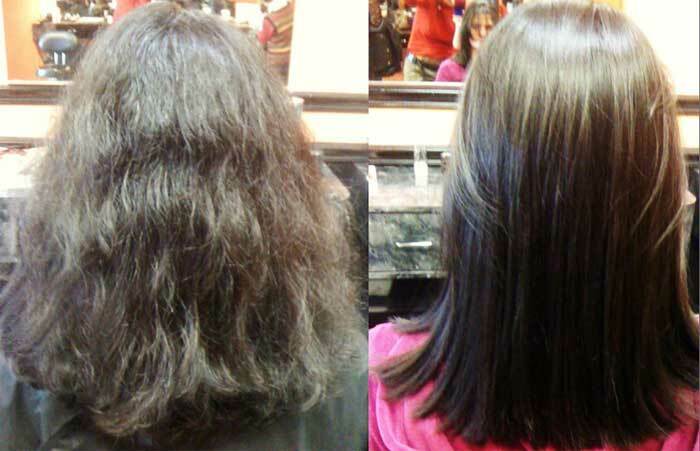 How does keratin improve hair? Because it is the same protein hair is made of and when you coat hair with it, it "fills in" the rough spots (like potholes) and smooths the cuticle. 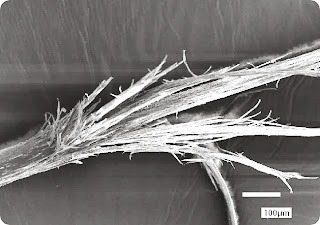 The chemical they use is necessary to bind the keratin protein to the hair shaft -- the formaldehyde (or other aldehyde or whatever's in the "gentler" ones) plus heat do the binding. 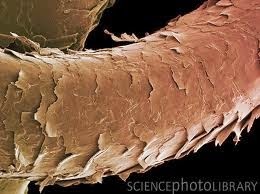 Strand of hair up close - microscopic view. 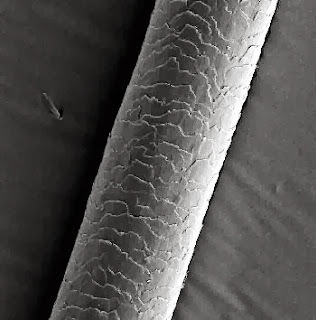 When those layers of the cuticle lie flat, the hair is shiny and flexible. When the cuticle is rough, the edges stick up like this. Keratin smooths it down and "fills in the potholes" in effect. 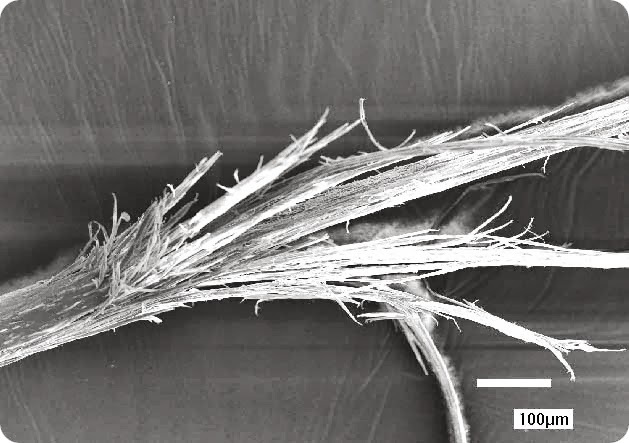 Kindof a terrifying photo of split ends. I was told not to wash for 24 hours (with Coppola you have to wait 3 days) and cannot use a shampoo with sulfates. She said it should last about 3 months (possibly longer if I don't wash my hair every day). I have heard of people finding hair stylists on Craigslist or through referrals that will do it for as low as $170 so ask around. If you get a Groupon or coupon, look at the Yelp reviews for that salon -- I did a fair amount of research first since I *did* see coupons for hair keratin treatments and a lot of people reported that they experienced heavy upselling; the hair stylists ended up charging more for "better quality" keratin and pressured customers to buy special shampoos, conditioners and other treatments just so they could recoup the costs lost in the discount. Maybe it's still worth it -- just do your research. After you sleep on your hair before you're allowed to wash and style it, it will look messy when you wake up. No worries, just flat-iron it smooth again. Score: now you're sealing the keratin into your hair again. Be careful not to tuck it behind your ears or pin it up or throw it in a ponytail in that time before you can wash it out; anything you do will fix that shape into it. 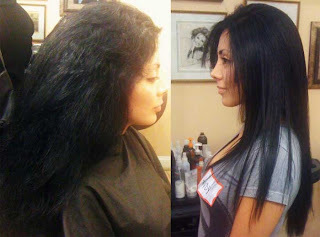 Next time I may try a "glaze" -- a friend told me her stylist will not do the Brazilian keratin treatment because she is convinced it's too harsh for hair, but will do a glaze after coloring and it makes her hair look great. It doesn't straighten it, but it does smooth the hair shaft and make it look shiny. Since keratin didn't work for me, I will see if that is any better. If so, I will post photos here so you can compare the results. Thank you for stopping by. If you have any questions, leave them in the comments below -- my blog notifies me and I will pop back over and answer them as soon as I can. Best of luck! I'll get You some if you like? Hmm? Oh this is interesting. I just looked it up on Amazon -- I think I'mma give it a try -- the reviews look really good. Thank you! You're hilarious! This sounds really familiar. I'm starting to suspect we're related somehow. I looked at that Brazilian thingy maybe a year ago when one of those frou-frou girls posted about it on FB. I did the same as you, researched the hell out of it looking for proof that it was horrible. It had to be horrible, right? I wanted to know or see the after AFTER pictures. What did it *really* do to your hair? I never found any and figured it was because people weren't bitching about it yet, weren't yet aware of how bad it would ruin your hair. Or that they didn't care because they felt temporary beauty was so worth frying and ruining your hair for. I never did it. 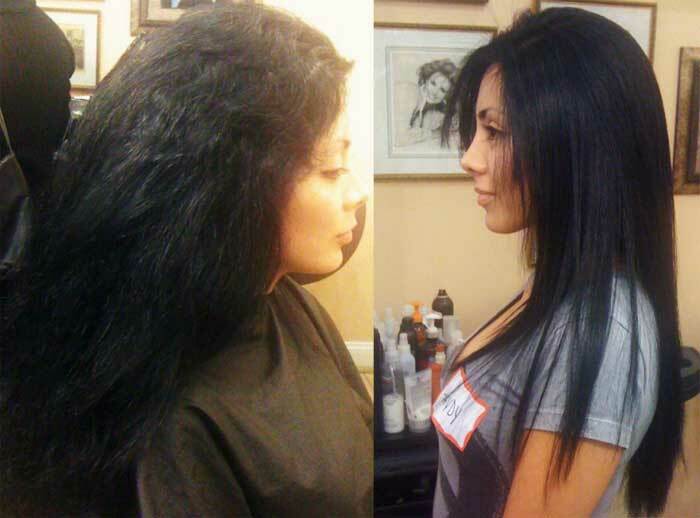 Let us know the end result of your drug store alternative? Hello there, I am so excited I found your site, I really found you by error, while I was researching on google for Keratin Treatment Sydney, Anyhow I am here now and would just like to say kudos for a fantastic post and a all round thrilling blog (I also love the theme/design), I don’t have time to go through it all at the moment but I have saved it and also included your RSS feeds. The epilogue to this story, which I should have posted earlier, is that the over-the-counter Brazilian Keratin treatment didn't really do much. Those photos are all from salons so maybe that's just what people have to do to get those results. The drugstore keratin stuff weighed down my hair and made it look a wee bit thicker and sleeker for a few days and that was about it. It wasn't very noticeable. 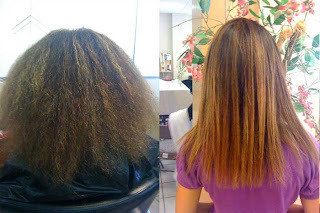 You're better off just doing a deep conditioning treatment for your hair. However, I have been trying something new which has been making my hair look less frizzy -- I'm not washing it with soap. I'm washing it with (and I know this sounds weird) conditioner. I read it somewhere and decided to give it a try -- the rubbing motion of your fingertips on your head is what cleans off your scalp so I scrub heartily, rinse well and then -- I know, also weird -- condition. The natural oils from my scalp are now allowed to do their thing (coat the hair shaft) and end up making it look pretty good! I do wash it maybe once a week or so -- whenever it looks like it needs it -- with a gentle shampoo that contains no sulfates. 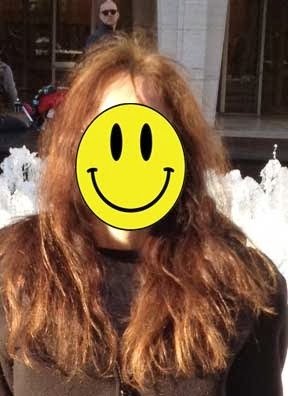 My hair is fine, thin, wavy (frizzy) and very dry from processing. And this seems to be just what it needs. I have also found that if I twist it around my finger before fully dry and let it air-dry naturally, that curl looks much healthier than any I try to create with a hairdryer or curlers. I get a lot of compliments when I do it this way but I have to leave it curled up like that until it's dry. To minimize the amount of time, I blow dry it until it's just slightly damp and then apply my favorite hair stuff (which varies). I think it's less the product that's important and more the process so you might be able to use whatever you already really like.